“Part of what makes a country a good bet for retirement is its affordability,” says Jennifer Stevens, International Living’s Executive Editor. “It’s that simple. So we assess the value baby boomers get for their dollars overseas and come up with a short list of the spots where greenbacks stretch the most—that's the countries around the world that top the Cost of Living category of our annual Global Retirement Index. The five countries that score highest in the Cost of Living category of International Living’s 2019 Annual Global Retirement Index are…. For the fourth year in a row, Cambodia takes the top prize in the Cost of Living category of the Annual Global Retirement Index, scoring full marks: 100 out of 100. 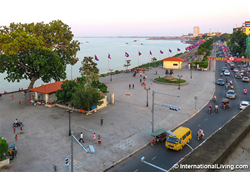 When folks dream of visiting Cambodia they are initially more likely influenced by the exotic draw of its ancient temples, royal palaces and saffron-robed monks or the beautiful beaches and undeveloped islands on the southern coast than anything else. But the low cost of living leaves them astonished. Cambodia is a place where retirees can upgrade their lifestyle to one of luxury on a modest budget. Paul has lived in the capital, Phnom Penh, for two years, lured by the incredibly low costs he observed on a vacation to the country. “The rent for my Western-style apartment is $275 a month, and even with utilities, air conditioning, and cable television, I only pay $380 for everything,” he says. These low costs let expats in Cambodia live richly on a poor man’s budget—a bottle of Champagne goes for $25 (as a former French colony, the European influence can still be felt in Cambodia) or a round of golf on a pro-designed course with caddie for $65 a day at the country club. Southeast Asia is one of the world’s most popular tourist and retiree destinations. With its tropical climate, mouth-watering food, and bewildering range of shopping delights, the region melds together big-city buzz with the charm of small historic towns, and low-key beach life. The region’s rising star, Vietnam, takes second place for Cost of Living, just one point behind Cambodia, at 99. St. Louis, Missouri natives Esther and Lloyd Bedik live in Da Nang, the largest city in Central Vietnam. The Bediks rent a two-bedroom apartment overlooking the gorgeous Han River, which runs right through the city. “Our apartment is about 1,200 square feet, and it came fully furnished, even with a built-in oven, which is quite unusual for Vietnam,” Esther says. “The best thing is the view of the riverfront from the balcony and from our bedroom. We could live much less expensively, but the view made me feel like I had to have this apartment. Lured by the rich culture, first-class healthcare, and low cost of living, an increasing number of expats are calling Thailand home. The country—taking third place with 94 points—offers a wide range of great retirement options from vibrant towns and cities to laidback beach spots and highlands. The country’s second-largest city, Chiang Mai, is well known as being one of the top places for retirees and digital nomads to settle—a place to upgrade their lifestyle. “The chance to live an opulent, resort lifestyle is at your fingertips,” says Rachel Devlin, IL’s Chiang Mai correspondent. “You’ll find the top resorts offering gym memberships to local expats—they’re a bargain. For just over $500 a year, you can have a membership to the Rati Lanna Resort & Spa. Peru and Bolivia are tied for fourth place with 92 points. Machu Picchu is by far one of the most iconic landmarks in South America but there is much more to Peru than this ancient Inca citadel. Miles of unspoiled beaches, hundreds of other archeological sites, colorful colonial cities, and dense tropical jungles. And all of it is remarkably low cost. Walter Rhein, 43, is originally from Wisconsin but has been living in Peru on and off for the past 17 years. He first moved to the capital city, Lima, in 2001, and lived there full-time for the next eight years. Now, he and his wife maintain residences in both the U.S. and Peru, and they spend a considerable amount of time in Peru each year. Nowadays, living in Lima costs more, but it’s still affordable. “You can have someone live with you and prepare your meals for under $500 a month,” Walter says. “Pharmaceuticals is another big factor. I use an inhaler…my Ventolin inhaler in the U.S., with insurance, is $25. In Peru I can get the same inhaler for $6. There was another one for asthma, the Advair disk. That’s $250 a month in the U.S. Here, it is $50—buy two, get one free. From adventurous mountaineering routes, to the lush Amazon Basin, and the Uyuni Salt Flats, Bolivia attracts visitors in their droves each year. But, with warm, welcoming people and a low cost of living, more and more are calling the Andean nation home. In 2015, at age 66, Terry Booher moved to Cochabamba in Bolivia’s central highlands. Part of Terry’s decision to move was because he needed somewhere dry and warm to help manage a long-term health condition he’s struggled with since serving in the Vietnam War: congestive heart failure (CHF). Terry ended up staying in that hospital room for eight days. In that time, he was seen by four physicians daily, he wore an oxygen mask around the clock, and three separate procedures were performed to drain fluid from his lung. Every morning he had several laboratory tests on his blood, along with a chest X-ray. He also had a pacemaker adjustment and an echocardiogram. The entire hospital stay amounted to just $2,800 for everything. Cochabamba is a popular choice among expats in looking for a slow lifestyle and access to creature comforts from home. Eating out is an affordable pleasure, from the high end right down to street-food outlets. No matter which part of Cochabamba you’re in, you will find restaurants serving fried or rotisserie chicken piled high on top of rice and fries for about $1.50 to $2. Not only is the healthcare and food more affordable, so is the real estate. Terry moved to a detached home that looks like a miniature White House and costs him only $500 a month in rent. That same home would cost $2,000 and up in almost any U.S. city.